Punisher, The (2004) Rising star Tom Jane and superstar John Travolta go head-to-head in the all-action blockbuster The Punisher. Jane plays Frank Castle, an FBI agent whose family is brutally murdered in retaliation when an undercover operation goes wrong. Surviving the attack, Castle remakes himself as The Punisher - a heavily armed, one-man killing machine who will not stop unitl sadistic crime boss Howard Saint (Travolta) has been brought down...and his family avenged. 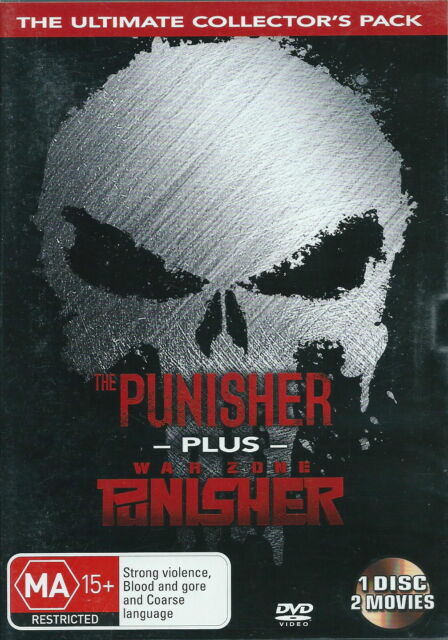 As one man becomes judge, jury and executioner in this hard-hitting adaptation of the legendary Marvel Comic, The Punisher delivers blistering action and all the big-screen excitement you're looking for.Punisher, The: War Zone (2008) Waging his one-man war on the world of organized crime, ruthless vigilante-hero Frank Castle sets his sights on overeager mob boss Billy Russoti. After Russoti is left horribly disfigured by Castle, he sets out for vengeance under his new alias: Jigsaw. With the "Punisher Task Force" hot on his trail and the FBI unable to take Jigsaw in, Frank must stand up to the formidable army that Jigsaw has recruited before more of his evil deeds go unpunished.